Preheat oven to 400°F. Slice the Brussels sprouts in half, lengthwise. Don't trim the ends, as they'll hold together better with them. 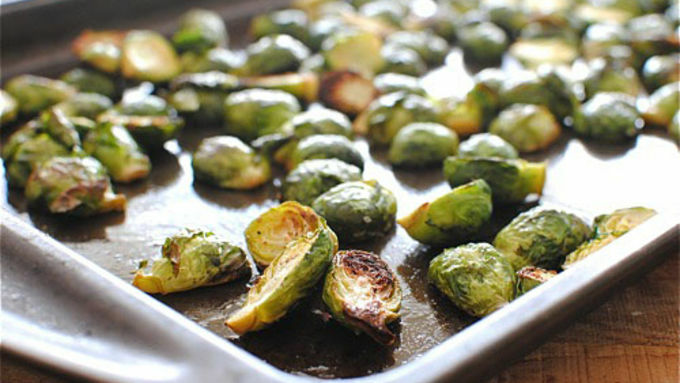 Toss the sprouts on a rimmed baking baking sheet with the oil and a good sprinkle of salt and pepper. Bake for 40 minutes total, but start checking around the 25-minute mark. Toss 1-2 times during roasting time so they brown evenly. 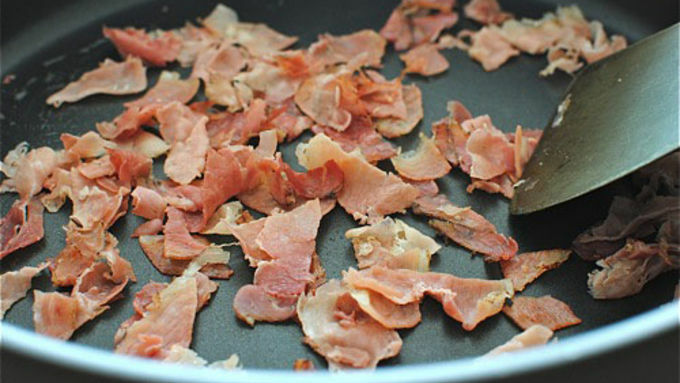 In the meantime, chop up the prosciutto into small chunks. Heat a medium skillet over medium-high. Add the prosciutto and saute for about 5 minutes, until nice and crispy. Set aside. 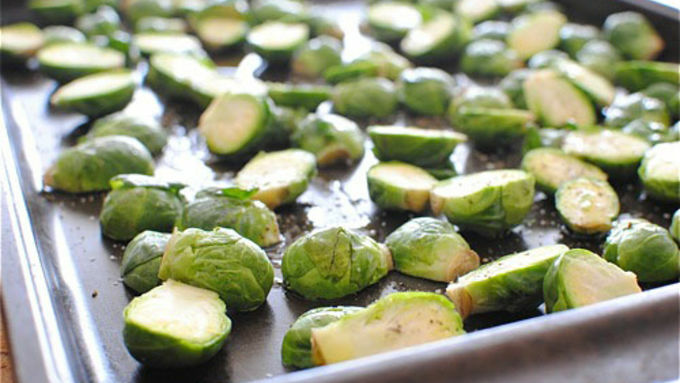 Remove the sprouts from the oven and let them cool about 5 minutes, or until you can handle them. Using toothpicks, slide on a sprout half, followed by a slice or 3 of the ham, then bookend it with another sprout half. Continue until you have about 32 mini skewers. Arrange on a platter and serve immediately. 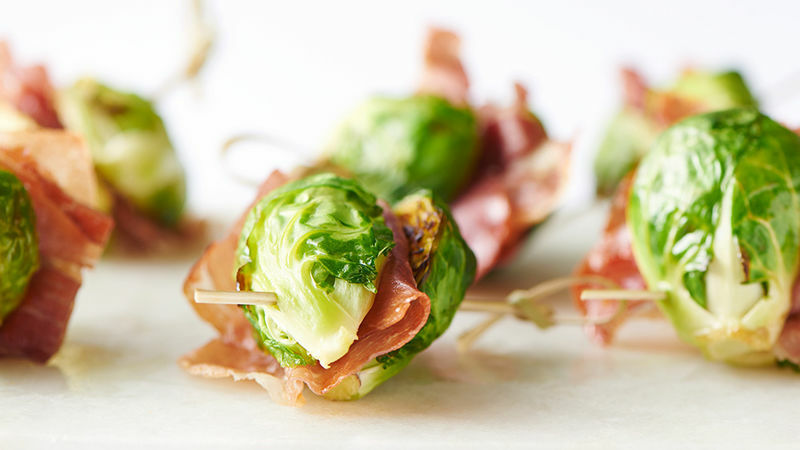 Brussels sprouts: you either love 'em or hate 'em. I happen to wrangle a healthy obsession with them, so I'd like to show you the E-A-S-I-U-U-U-S-T way to make, eat and downright flabbergast your guests with them. Plus they're sandwiched with crispy prosciutto like little books on toothpicks, so you're positively going to hear multiple rounds of "aw!" and "so cute!" So, you start with some gorgeous Brussels sprouts. And some wonderfully salty prosciutto. Toss a slice into your mouth before you start cooking. It's good for your health. 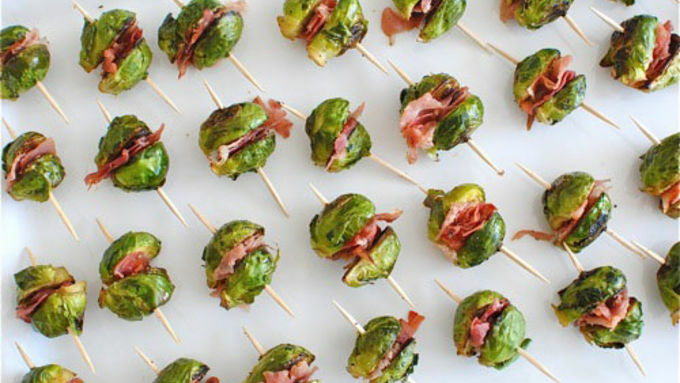 While your sprouts are roasting, cut the prosciutto into little chunks and crisp 'em up in a skillet. Go ahead and toss some into your mouth again. And when you're all done cooking and have assembled all your little sprout skewers, taste test one to make sure they're perfect. Go ahead and taste another one. You know. Just in case. Quality control, etc. Take the remaining three left on the platter to your guests. (Oh, you thought we were joking?) Still hungry? We've got even more appetizer recipes, right this way.